The drudgery of washing and ironing has long been something that householders have been keen to get off their hands ever since clothes were invented. Even in the industrial slums of the eighteenth century people eked out an existence by doing other people's washing to supplement their meagre wages. And it's no different today many busy households are prepared to pay someone else to do the job for them. If you have a 'daily', someone who comes in regularly to clean and do other housework, then they may well do some of the washing and ironing for you, but it's unlikely that they will take clothes to and from the dry cleaner for you. An au pair or other live-in help might do that, but also many dailies will not take on ironing either, nor will they do washing. It depends on the person and the arrangement you have with them. Assuming you don’t have access to someone who will do these jobs for you in your home, then you'll be looking for an outside service. If there's a launderette nearby then they might do service washes, and they often take dry cleaning too. 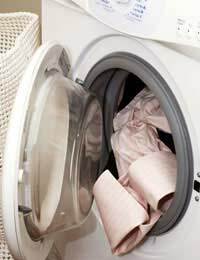 The trouble with service washes is the need to bulk items together into large washes for it to be economical, as their machines are so much larger than domestic ones. It is thought that the service wash is responsible for the almost uniformly grey underwear sported by single men in the United Kingdom today. A launderette will often have the dry cleaning taken off to a central facility and returned rather than being dealt with on site, and that might make things more difficult if there is a problem, such as a lost or damaged item. Not having the staff or the manager who actually deals with the cleaning on hand could make it more difficult to get the problem resolved. If you live in an area with a big enough catchment of reasonably well-off and busy people, then it's quite likely that someone will have started up a laundry service that takes clothes from your door and returns them, all done and dusted. Cities certainly have businesses like this and they are also often found where a few towns are grouped together to make a reasonably sized urban area. Obviously there's a premium charge for a service like this but for many people, certainly busy professionals, it's considered an investment in time, the time that they can claim back by not having to do these jobs. To find services like this, a look on the internet is most likely to find them. The internet was not particularly good in the past for finding local businesses, but anyone setting up a service business in the last few years is almost certain to have an internet presence, and improvements in search engines have made it easier to pin down results to a local area. You might also find them advertising in shop windows and local newspapers, particularly in more rural and spread out areas, where it's harder to pin down an area on the internet. One last service that might be of interest is one for those special occasions with the marquee or gazebo in the garden. Many of the laundry and ironing services will hire out tablecloths and napkins, either doing it themselves or through a company they have an arrangement with. So not only do you not have to buy them in the first place, you don't have to wash the stains out afterwards. Now that's a result for many hard-pressed hosts and hostesses.